Airshow flights involving a passenger plane flying alongside the Patrouille Suisse – as seen at the Lauberhorn Ski Races – is not only an impressive event for all spectators on the ground, but also for several million viewers who get to enjoy the performance online. For the three pilots in the SWISS aircraft, this type of flyover is no routine flight. It's an absolute highlight. There's still a lot to be done before the big day. SWISS pilot, Robert Emeri, recorded the preparation phase of the spectacular flights at the World Ski Championships in St. Moritz. Robert has always been fascinated by flying. And after more than 30 years in his job, nothing has changed, either. "My uncle was an air force pilot. I've always admired a photo of him that I've got at home. He has a beaming smile in his military plane," he recalls. Back then, Robert didn't realise that – one day – he would be soaring above the clouds in a uniform, too. But it was already a young child's dream. Robert enthuses about these special flights. "It's as though you're in a film during the flight. You can only really relax at the end of a perfect performance – and that's when the euphoria kicks in!" While only two pilots sit in the cockpit during a normal scheduled flight, three pilots are in the plane during a show flight. Robert, Mission Commander, sits at the front on the left. 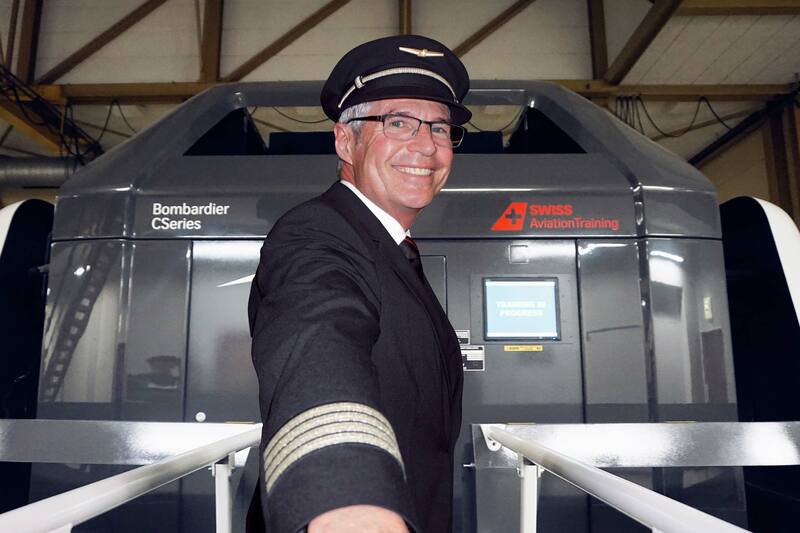 On his right sits Assisting Pilot Andres 'Res' Müller, who helps Robert during the flight. The third seat in the cockpit – the 'jumpseat' – is occupied by Ivo Vogel, the 'Safety Pilot'. "He keeps an eye on everything and can tell us if he notices anything untoward." The autopilot is never used during a flyover. Robert pilots the whole flight manually. "The CS 100 has a very precise steering system." Extreme concentration is demanded of the cockpit crew throughout the entire performance. Preparation starts well ahead of the day. An airshow flight is planned right down to the very last detail, which is why the first discussions take place months before the event. Robert has been involved in planning, together with a whole range of different SWISS departments, since November 2016. The pilots are also in continual contact with the Patrouille Suisse and the Federal Office of Civil Aviation (FOCA). "Because of the mountainous area around St. Moritz, extensive preparation in terms of the precise route, radii and possible tilt, is required," Robert explains. Res and Robert with the pilots of Patrouille Suisse. Flying in an airshow with the Patrouille Suisse is a matter of heart for the ex-army pilot – especially during the FIS Alpine World Ski Championships in St. Moritz. "I grew up in Villars, a ski resort in the west of Switzerland, so I have strong ties to this winter sport." Besides various meetings with the FOCA and Patrouille Suisse, the main task is to calculate the route and flight path, to define the performance right down to the very last detail. Anyone who thinks that a computer calculates this for the pilots has got it wrong! The pilots do all this by hand – or, rather, in their heads. Plans for the airshow are continually tweaked with Res and the leader of the Patrouille Suisse, Simon 'Billy' Billeter, until they are perfect. "We draw the distances onto a paper chart and calculate speeds and altitudes." Once the calculations are finished, the plan is ready...in theory. Before putting the theory straight into practice in the plane, first stop: flight simulator. Robert doesn't put it to the test on his own. "I sit with my team of SWISS pilots in the flight simulator cockpit and fly the entire route." No matter how good the plan is, if the weather's bad, the show won't go ahead. But what is perfect weather for such an event? "There can't be any clouds at a lower altitude than 3200 metres along the planned flight path," explains Robert. Weather conditions change extremely fast in the Alps. Even if it doesn't look good to begin with, we still take off. There is always a chance that the clouds will clear before the show. Another SWISS C Series pilot is located in the target area of St. Moritz so that he can inform the cockpit crew of the exact weather conditions by radio. The weather is usually good in St. Moritz and conditions were good every day apart from Friday. "I get up at 6 a.m., drink a cup of coffee and have a look at the weather conditions." Then Robert heads over to the airport. Everyone is talking about the weather here, too. A feeling of relief sets in: "The weather looks good." A final meeting takes place: "The crew make their way to the plane around two hours before take-off. Preparation inside and outside the aircraft is the same as with a scheduled flight." The three pilots are a well-oiled team and each member carries out his allocated tasks. Ivo checks the outside of the aircraft for abnormalities. Besides coordination with Patrouille Suisse, the cockpit computer also needs to be specially prepared. This includes the input of specific waypoints – unlike a standard scheduled flight. Robert and his team take off from Zurich and the Patrouille Suisse from Emmen. The aircraft meet up above Samedan. "I was in St. Moritz a few weeks before the flyover to check out the topography of the area," explains Robert. The flight was planned in such a way that the C Series could theoretically wait for an hour above St. Moritz if there were any delays. Then suddenly, everything happens very quickly: The cockpit crew are fully concentrated on their performance. Robert is overwhelmed with emotion after the flyover – a combination of intense relaxation and euphoria "It's a moment I can't even begin to describe!" The SWISS and Patrouille Suisse airshow was also an unforgettable highlight for spectators on the ground.